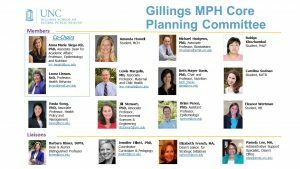 Read final recommendations from the Gillings MPH Core Planning Committee! The MPH is changing, and the Gillings School aims to lead in this arena. 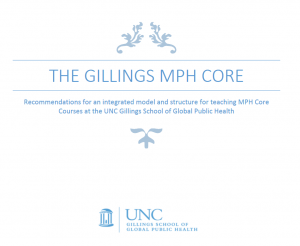 Beginning in 2015, faculty, staff and students from across the School have come together to begin developing a new Gillings MPH core – the core courses all MPH students need to take to graduate from Gillings – from the ground up. We are one of the top-ranked schools of public health in the nation. We should lead change in developing the integrated core. Together, we have the experience, knowledge, leadership and commitment to create the next generation Gillings MPH core. Together, we can determine how. Process, structure and content are ours to decide. In 2015, the Gillings School convened a committee of faculty, staff, and students to draft the initial plans for the integrated core curriculum. Drawing upon a rich body of research, they sought feedback from leaders in the field of public health education, Gillings faculty and staff, and MPH students to create the foundations of the integrated core curriculum. In February 2015, developed Draft Guiding Principles and a framework for the integrated core. Deans Rimer and others conducted town hall meetings and focus groups with faculty, students and staff to find out more about their ideas, and concerns. Leaders from other schools of public health visited and shared with us their experiences in redeveloping their MPH core courses (watch the webcast!). The MPH Planning Committee developed a set of competencies based on ASPPH domains, and then mapped those competencies to skills delineated by our accrediting body, CEPH. The Committee then developed several draft prototypes. These prototypes evolved significantly after Town Hall meetings and attendance at faculty meetings in Fall 2015, and the committee selected one draft prototype for further consideration of stakeholders. The Committee conducted a survey in December 2015 to glean final feedback from faculty, students and alumni on this draft prototype and presented draft recommendations to the Dean’s Council. In February 2016, the School’s Dean’s Council approved final recommendations from the MPH Core Planning Committee: Read our final report! Drivers for change. The 100th anniversary of the groundbreaking Welch-Rose report, the conceptual framework for schools of public health, prompted a comprehensive examination of public health education, including the BSPH, MPH and DrPH degrees. The world has changed dramatically since Welch-Rose, but public health education has not. Global and local are inextricably connected. We must reflect this reality in our curricula. Disciplines are still relevant, but the world’s most complex challenges will be solved by people working at the intersections of disciplines. Students who work in interdisciplinary teams while in training are better prepared to solve problems. More and more students come to MPH programs with bachelor’s training in public health but without much work experience. MPH coursework should demand a higher level of competency; and students should not be asked to duplicate coursework they have already taken. High quality practicum experiences are essential for these students. New opportunities, including the 2010 Patient Protection and Affordable Care Act, challenge us to be accountable for the health of populations. Our curriculum should be responsive to these opportunities. Framing the future. 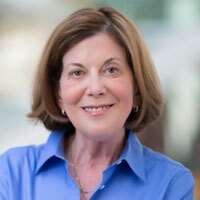 In its comprehensive examination of the MPH degree, ASPPH flagged the need to prepare students for leadership roles in which they will effect change, work on complex problems, manage budgets, lead boards, be facile with big data, evaluate using metrics, conduct strategic planning and collaborate across organizations. These factors and more led the ASPPH MPH Framing the Future Task Force to call for major changes in the MPH degree, emphasizing that it should consist of a generalist core and specialty concentrations. 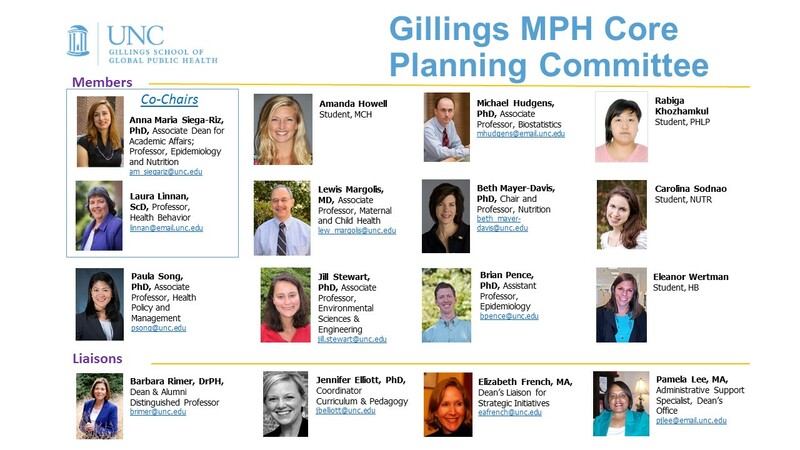 Next generation Gillings MPH Core. For decades, the Gillings School has set a national standard in training outstanding public health practitioners and leaders. We have the opportunity to lead in this sphere once more for a new generation of public health professionals. Together, we can create a curriculum that builds on the strengths and tradition of community-engaged excellence that a Carolina education represents and that will be the best possible training for future public health leaders. Thank you for joining us in this effort. 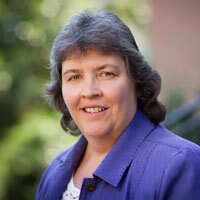 We look forward to working with you and to the outstanding curriculum we will create!